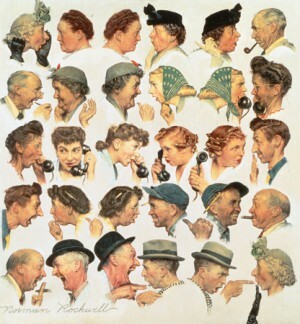 Stockbridge, MA, December 20, 2013—”The Gossips,” one of Norman Rockwell’s most popular paintings, has returned to Norman Rockwell Museum to be displayed for a limited time. 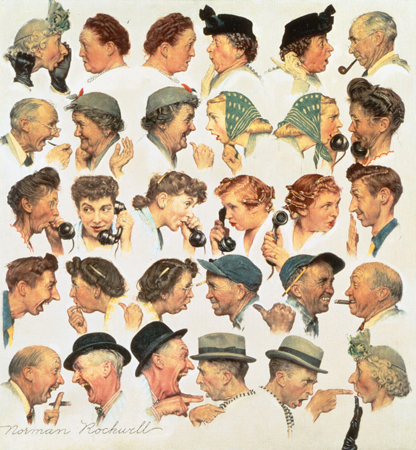 Created by Rockwell for the March 6, 1948 cover of “The Saturday Evening Post,” the original painting was previously on loan to the Museum for over two decades before being sold during a record-setting auction of the artist’s work at Sotheby’s in December of this year—the loan is made possible through the generosity of the artwork’s new owner. In addition to “The Gossips,” other recent Rockwell loans to the Museum include the “Saturday Evening Post” cover paintings: “Merrie Christmas (aka Man with Christmas Goose)” (1938), created for the December 17, 1938 cover and featuring the Charles Dickens character, Samuel Pickwick preparing for the holidays; “Crestwood Commuter Station” (1946), which appeared on the November 16, 1946 cover of “The Post,” and featured the hectic commuter rush at a railroad station in Crestwood, New York; and “Boy Making Football Tackle” (1925), which graced the magazine’s November 21, 1925 cover—all paintings are courtesy of private collections.